One lesson, at least, shines clear out the gloom: the futility of simplistic solutions. Despite our natural shrinking, we must recognize that the Great War is a normal phase in human evolution. Europe's [and America's] agony is the inevitable travail of birth--the birth of a new age. That new age must evolve normally according to those basic laws of life which we so imperfectly understand. How futile--perchance how dangerous, then--are present efforts to sooth Europe's anguish with the nostrum of a phrase; or, with the petty yardstick of a formula, to plot the evolutionary pathway of the morrow. How absurd to assign Europe's [and America's] ills to a single cause, such as "secret diplomacy," "Prussian militarism," "British navalism," or "Pan-Slavism," [or Islamism], and then, having verbally demolished this poor bogey, to announce the advent of the Golden Age. No, no! Life is not so simple as all that. This cataclysm was not the work of any man or set of men. Its incidents may have been within human control. Its substance was the inexorable legacy of the past. The ultimate reality of the Great War thus revels itself as merely a doffing of the old and a putting on of the new. Martin Jacques in When China Rules the World: The End of the Western and the Birth of a New Global Order (2009) helps bring an aspect of knowledge of why President Obama made his pilgrimage to Africa. In "The Middle East And Iran," Jacques writes that nearly two-thirds of the world's proven oil reserves are concentrated in the Arabian Gulf, with Saudi Arabia controlling over a quarter, and Iraq and Kuwait sharing a little under a quarter. These three countries control about half of the world's known oil reserves. Iran accounts for a little under a tenth of world oil reserves. The Gulf States are responsible for nearly 40 percent of world crude oil exports, with Saudi Arabia's share around 12 percent and Iran's 7 percent. China became a net importer of oil products in 1993 and of crude oil in 1996. It is estimated that by 2020 China will have to import in the range of 57-73 percent of its oil requirements. China first became seriously concerned about its future oil supplies during the 1990s and as a result began to take steps to ensure their reliability. Until 2006 its biggest single supplier was Saudi Arabia, but Iran is also very important. It would therefore be natural for china, but Iran is also very important. It would therefore be natural for China to seek a much closer relationship with the Middle East. Unlike Africa, however, the region is regarded by the Americans as its sphere of influence. The US has become increasingly embroiled in the Middle East over the last thirty years, building extremely close relations with Israel and Saudi Arabia in particular, and becoming involved in two Gulf Wars with Iraq, the second largest oil producer, with the invasion in 2003 culminating in the country's occupation. The Chinese, as a consequence, have trodden very warily in the region for fear of antagonizing the United States, whose relationship, ever since the reform period began, it has prioritized over all others. In contrast to Africa, which has clearly now assumed a central importance in its foreign policy, China regards the Middle East, as a result, as of only second-tier significance. At the heart of China's strategy in the Middle East lies Iran, with which it has long enjoyed a close relationship. The two countries have much in common. They are both very old civilizations with rich histories of achievement and a strong sense of superiority towards other states in their respective regions. They have also both suffered at the hands of the West, which they deeply resent, believing they would prosper rather more in a world no longer dominated by it. Although interests rather than attitudes have primarily driven their relationship, there is a certain sense of affinity between the two countries. As an emergent global power, China naturally seeks friendly relations with more powerful states as this in turn is likely to enhance its own influence, and Iran very much falls into this category. China nevertheless has acted cautiously in its relationship with Iran, concerned to preserve its international reputation in the face of the militant Islamic ideology of the Iranian regime post-1979. The single most important constraining factor in China's stance towards Iran, however, has been the attitude of the United States. China has walked a skillful diplomatic tightrope, at time cooperating with Iran in ways contrary to US policy and at other times cooperating with the United States in ways contrary to Iranian policy. Until quite recently it managed to thwart American attempts to impose economic sanctions on Iran and it successfully resisted efforts to excommunicate Iran after it had been branded a member of 'an axis of evil' by the Bush administration. China's economic relationship with Iran began to grow after the departure of the US and UK following the 1979 Revolution. The key to their blossoming partnership has been China's export of large quantities of high-tech capital goods, engineering services and arms to Iran in exchange for oil and raw materials, with trade between the two countries growing extremely rapidly during the 1990s. In 2003 two major Chinese motor vehicle manufacturers established production plants in Iran. China negotiated a major package of oil deals in 2004, as a result of which it became a major stakeholder and one of the largest foreign investors in the Iranian oil industry, in addition to Iran being one of its biggest suppliers of oil. And it signed a further major agreement in 2007 to develop part of the giant Yadavaran oilfield. The US regards US regards Iran as an alternative power broker in the region and a major potential threat to its interests--hence its long-running hostility towards Iran. In the long run, China would probably be content to see Iran playing a major, perhaps even dominant, role in the Gulf region, given that it will be a long time, if ever, before China itself could perform such a role; every global power needs allies and Iran is China's natural ally in the Middle East. As the international relations expert John Garver argues, a dominant China in East Asia combined with a dominant Iran in West Asia could ultimately become a central element of a post-unipolar, China-centered Asia in the middle of the twenty-first century. Meanwhile, in order to keep its options open, China is likely to continue to help build up Iran while seeking not to antagonize the United States. The desire of the Obama administration to bring Iran in from the cold could make life easier for the Chinese on this score. There are other possible long-term scenarios. China's highest priority is Taiwan, and the biggest obstacle in the way of reunification is American military support for the island. The most likely cause of military conflict between China and the US is Taiwan; and in the event of war, China would be extremely anxious about the security of its maritime oil supply routes, especially in the Malacca Strait and the South China Sea, which could easily be severed by the US's superior air and naval power. In such an eventuality, Iran could at some point offer the possibility of a land-based supply route from West to East Asia. But there is another possible future scenario namely that China and the US could arrive at some kind of trade-off involving Taiwan and Iran in which the US agrees to stop sending weapons to Taiwan and China volunteers to do the same with Iran. In effect, China would agree to sacrifice Iran in return for Taiwan, its greater foreign policy priority. Such a deal would represent a tacit recognition that East Asia was China's sphere of influence and the Middle East, America's. Lothrop Stoddard and Glenn Frank in Stakes Of The War: Summary of the Various Problems, Claims and Interests of the Nations at the Peace Table (1918) declare that they have not considered the problem of China; that problem, as such may not come up for specific action by the conference that settles World War One, although it doubtless holds important possibilities for the future. We have not treated the problem of straits and canals; that problem promise to fall largely in the field of international regulation and control, which has not lacked constructive treatment at many hands. Stoddard and Frank declare that the colonial questions which will arise for settlement at the close of the [WWI] differ radically from the class of problems which have been treated in the body of Stakes of the War. In those problems, while the material basis has been territory, the spiritual factors have been race and nationality. Those areas are all inhabited by self-conscious populations, mostly civilized, whose political aspirations form a vital part of any settlement proposed. This is not the case with the colonial areas which can reasonably be expected to come before the peace conference. With the partial exception of German South-west Africa, none of these colonial areas contain a settled white population, while in all save Kiao-Chau the natives are savages or semi-savages, incapable of self-government and devoid of national consciousness. In fact, with the exception of Kiao-Chau and the German possessions in the Pacific, the colonial problems which seem destined to come up for settlement are confined to central Africa. The main body of “Appendix: The Colonies” will therefore be devoted to the central African situation, with brief mention of the Kiao-Chau and German pacific matters. The Kiautschou Bay concession was a German leased territory in Imperial China which existed from 1898 to 1914. Covering an area of 552 km2 (213 sq mi), it was located around Jiaozhou Bay on the southern coast of the Shandong Peninsula (German: Schantung-Halbinsel). Jiaozhou was romanized as Kiaochow, Kiauchau or Kiao-Chau in English and as Kiautschou or Kiaochau in German. The administrative center was at Tsingtau (Pinyin Qingdao). Germany was a relative latecomer to the imperialistic scramble for colonies across the globe, a German colony in China was envisioned as a two-fold enterprise: as a coaling station to support a global naval presence, and because it was felt that a German colonial empire would support the economy in the mother country. Densely populated China came into view as a potential market, with thinkers such as Max Weber demanding an active colonial policy from the government. In particular the opening of China was made a high priority, because it was thought to be the most important non-European market in the world. However, a global policy (Weltpolitik) without global military influence appeared impracticable, so a navy was built. This fleet was supposed to serve German interests during peace through gunboat diplomacy, and in times of war, through commerce raiding, to protect German trade routes and distrupt hostile ones. A network of global naval bases was a key requirement for this intention. The acquisition of a harbor in China was from the start intended to be a model colony: all installations, the administration, the surrounding infrastructure and the utilization was to show the Chinese, the German nation and other colonial powers an effective colonial policy. Stoddard and Frank write that immediately after the beginning of the European War, German’s Pacific colonies were captured by the British and Japanese after a perfunctory resistance. At the present writing the German pacific possessions are still held by their respective conquerors. Kiao-chau is the broad, land-locked bay of Kiao-chau is situated at the southeastern base of the mountainous peninsula of Shan-tung, which juts out of the continental mass of China between the waters of the Yellow Sea and the Gulf of Pe-Chi-Li. In November, 1897, a German naval squadron entered the bay of Kiao-chau and occupied its port, the city of Tsing-Tao, as a punitive measure for the murder of some German missionaries. In March 1896, China leased the town of Tsing-Tao, the bay of Kiao-chau, and the shores thereof to Germany for a period of ninety-nine years, and in April the district was declared a protectorate of the German Empire. The waters of the bay of Kiao-chau cover an area of about 200 square miles. The shores of the bay and the city of Tsing-Tao—in other words, the land area leased to Germany—comprise another 200 square miles. Furthermore, the actual leased area was surrounded by a so-called “neutral zone” thirty miles wide, in which Germany obtained special privileges. The land-area of the Kiao-chau concession contained, in 1913, a population of about 192,000. The white population, including the garrison, was 4470, mostly Germans. At the time of its acquisition Germany had high hopes of Kiao-chau. That was the period when the partition of China among the great powers seemed inevitable, and since Kiao-chau was both a fine war-port and a good commercial harbor, Germany determined to make it the naval and commercial center of the empire in the Far East. Immense sums were spent on its fortification and on the development of Tsing-Tao, which soon became a handsome European town. Although the more sanguine prophets were disappointed, Kiao-chau attained a considerable commercial importance. The German-built railway into the Shan-tung hinterland tapped the economic resources of the province, and most of its foreign trade passed through the port of Tsing-Tao. In 1913 the export and import trade of the part of Tsing-Tao totaled nearly $19,500,000, while 923 vessels of 1,298,000 ton entered at Kiao-chau. The German-owned railway from Tsing-Tao to Tsinag near the Hoang-Ho had a length of 252 miles. A few days after the outbreak of the European War, Japan delivered an ultimatum to Germany, summoning her to deliver up the leased territory of Kiao-chau and, upon German’s refusal, Japan declared war. A strong Japanese army invested Tsing-Tao, while a Japanese fleet blockaded the port by sea. After a spirited resistance, Tsing-Tao surrendered on November 7, 1914. Since then the leased territory has been occupied by Japan, who has assumed all German’s rights in the Shan-tung hinterland as well. Among the numerous suggestions for a solution of the colonial problem, three types of solutions stand out as the most likely: (1) the old system of national control and agreed-upon spheres of influence; (2) the administration of the politically weak and unorganized territories of a world by a league of nations, if such an international organization is effected by the peace conference; (3) the administration of specific colonies by local centers of international control. National Control and Agreed-Upon spheres of Influence. The obvious difficulty in this system is that it contains an inevitable threat to the peace of the world. When the investor class of a given nation runs into difficulty in one of the weak and unorganized territories, when the investing interests of one nation clash with the investing interests of another, the investor turns to his home government for help. And since the problem of guaranteeing investments is inextricably tangled with the problems of diplomatic prestige and national honor, it has been a very natural development that the foreign offices should become collection agencies and insurance companies for the foreign investor class. Colonial history teems with instances where the business conflict of rival nations in colonial territory has reacted upon the situation in Europe, now menacing, now upsetting, the peaceful relations of Europe. Another difficulty involved in this solution is the latent threat that resides in the potential military power of the native populations, when the territory is in the hands of any of the great powers. A clear case of this is the extraordinary resistance displayed in this war by the native troops of German East Africa. As regards Kiao-chau, while it may be a source of distinct difficulty between Japan and China, it has probably fallen to the rank of a minor question as regards the former colonial ambitions of Germany. It may be doubted whether Germany has any special desire to get it back, for the reason that Kiao-chau is a relic of a played-out phase of world politics. When Germany acquired Kiao-chau, it looked as though China would be partitioned among the great powers; but since then China has become so self-conscious that the question of her partition is clearly adjourned, if not out of the question. And, in addition to this, the fact that Japan has become so much stronger, as a result of the weakening of the white world, makes it clear that an attempt at the partition of China would face the combined opposition of Chinese nationalism and Japanese imperialism. In the light of these facts, Germany’s attempt to regain Kiao-chau would be a game not worth the candle. Just after hosting Cuba's foreign minister at the State Department, Secretary of State John Kerry sat down with NPR Morning Edition host Steve Inskeep to discuss the restoration of diplomatic relations with that country, as well as the status of a nuclear deal with Iran. Kerry defended the Obama administration's stance on both countries, and said if diplomatic relations with Cuba or a nuclear deal with Iran were scuttled — either by a future president or Congress — it would hurt the U.S.
Inskeep pointed out that at least one 2016 presidential candidate, Florida Sen. Marco Rubio, has said he'd roll back Obama's Cuba policy. Kerry said either Congress or a new president could make that decision, "But I think it'd be a terrible mistake. The vast majority of the American people believe this is a very good thing to do. ... As time goes on, people will see the benefits that come from this policy." "We had diplomatic relations with the Soviet Union," Kerry continued. "We had diplomatic relations with then-called 'Red China'. We have to have relationships with countries to do business. And American citizens get hurt when we don't do that." On Iran, Kerry said if Congress failed to approve a nuclear deal with the country, the results would be disastrous. "I'm telling you, the U.S. will have lost all credibility," Kerry told Inskeep. "We will not be in the hunt. And if we then decided to use military [after a deal fails], do you believe the United Nations will be with us? Do you think our European colleagues will support us? Not on your life." Kerry said Iran would use the deal's failure as an excuse to enrich uranium. "[The deal's failure] will be a travesty, and Iran will begin enriching, claiming it is a right that they only gave up in the context of negotiations, but since negotiations are dead, they're going to resume their rights." He continued, "Iran will say, 'Aha, you see!' The Ayotollah will say, 'I told you, you can't trust the West. I told you you can't negotiate with these guys. They will lie to you. They will cheat you. And here they are, they let us down, and the Congress walked away. They have 535 secretaries of state. There's nobody to negotiate with.'" Kerry also responded to claims that the Obama administration was too eager to get a nuclear deal, and would pay a high price for one. 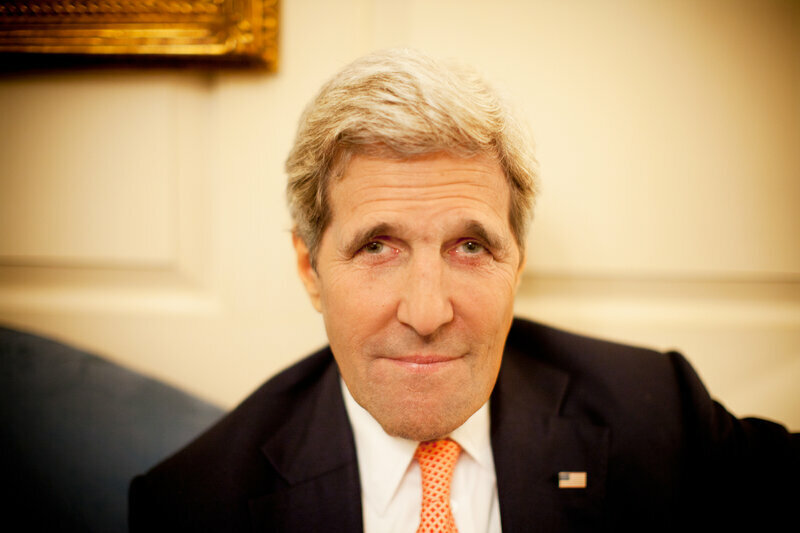 Kerry told Inskeep that he actually walked away from the negotiating table three times. "President Obama in almost every conversation would say, 'Remember John, you can walk away.' ... And I did walk away. ... So we had no compunctions about it, whatsoever. I think the fact is, we got the deal that was achievable beyond people's belief, and that's what you heard from people..."
Finally, Kerry touched on Republican presidential candidate Donald Trump's recent comments on Sen. John McCain's war record, [McCain spent more than five years as a prisoner of war in North Vietnam after his plane was shot down in 1967.] Kerry has spoken out in support of McCain. According to Martin Jacques in When China Rules The World: The End Of The Western And The Birth Of A New Global Order China and Iran are cut buddies because they share the same relationship with the West. Like John Kerry predicts, "If we don't do business with Iran, our allies will." This be a all nightie? to read in Library if? as in ` Unique Book. It was years ago. Thanks.